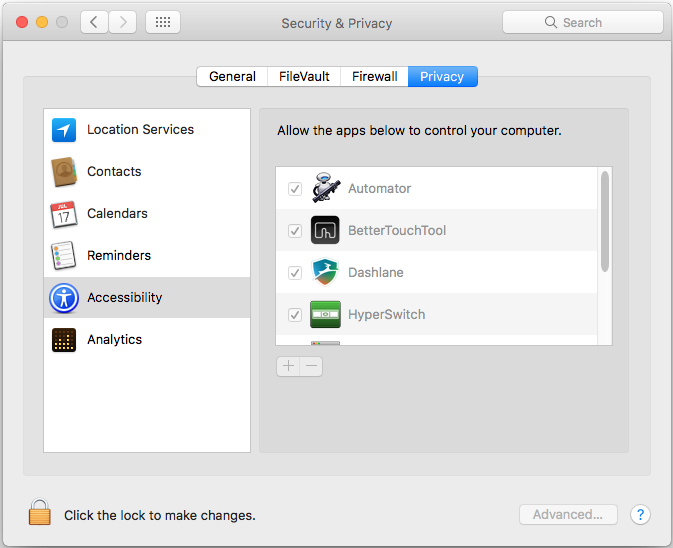 I'm using an application called Better Touch Tool which does keyboard mappings, and so requires that you give it permission to the Accessibility API in System Preferences > Security & Privacy. I did this immediately after installing the application as you can see in this screenshot. However, I've noticed something odd. I often will walk away from my computer and after some minutes it will show the screensaver and eventually go to sleep. When waking it back up, it seems this checkbox in the Accessibility settings has sometimes unexpectedly un-checked itself. This has happened to me at least three times now and I can't really explain it, besides to say that it only seems to happen after the computer has gone to sleep and come back. It's quite annoying because not only do I have to re-check the box to get it working again, it also requires a restart. Is there any reason why this box would get un-checked without me doing so manually? How can I prevent that from happening? Boastr, the developers of this commercial product, will be best placed to answer your question. They have a bug tracking page where you can report these kinds of problems. If they can help, please submit their answer here to help others. Not the answer you're looking for? Browse other questions tagged sleep-wake system-prefs accessibility . What does “'Copy Job' would like to control this computer using accessibility features” mean?